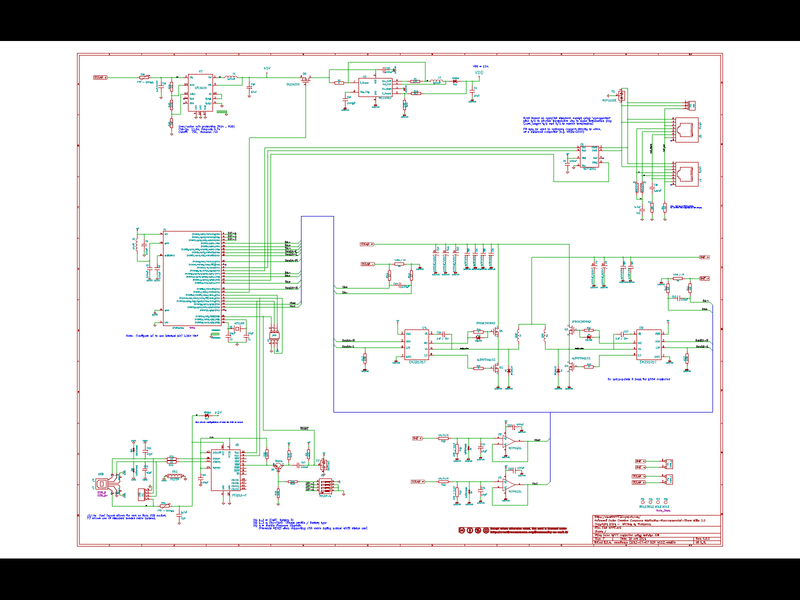 I have posted into the Schematic link above a .pdf of the latest schematic. Not a whole bunch has changed from the 1st rough-cut, Refining the FETs - settled on an asymmetrical pair: Faster switching top FET, and lower Rdon lower FET. Also have gone with DPAK devices for this 1st PCB FAB, may upgrade to the better PQFP ones later, but the DPAK ones will be simpler to replace if need be :-) Replaced the LDO with a 2nd switcher in the power supply sub-system, saving that 125mW overhead. And did a little SPICE modeling on the FETs and drivers and hence added a spot for some additional gate drive options (specifically the fast pull-down diodes on the High FETs) that might help with some of the cross-over losses. Click for larger view <BR/> Also see the .pdf under the Schematics link above. In the top 3D rendering above you can see some odd parts, notably the USB connector. 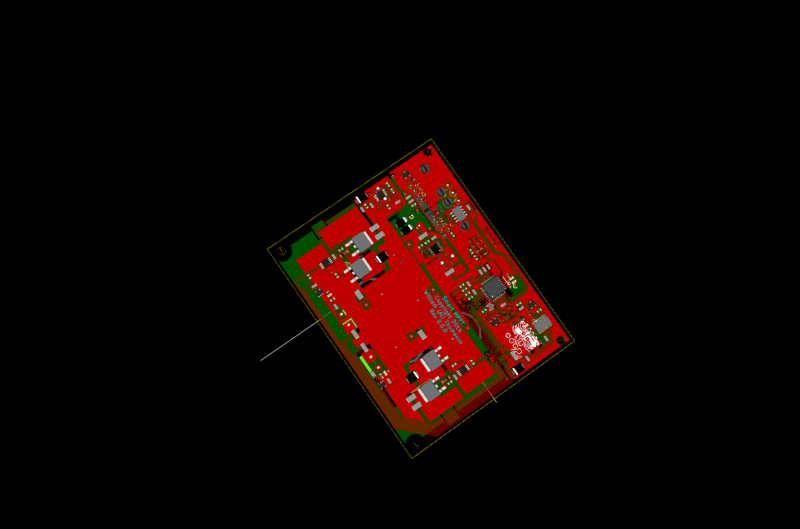 This is the result of stuffing options in the PCB design - I have in there the ability to use horizontal or vertical components for the USB, DIP switch, and the RJ-45 ports. Or, one can populate headers and use external cables (e.g., to place this into a waterproof box and use waterproof external connectors vs. wiring glands). Because all the stuffing options are in the schematic, they are rendered in the 3D view - each on top of the others. Still to do: I need to go through and confirm all the switching power supply calculations, inductors, caps, etc. (and there are three of them on the board!) The caps used on the solar buck are rather costly (around $2-3 each), and want to make sure I have in what is both needed, but not more than what is. I also need to finish the PCB layout, just a couple more routs to do, and confirm some thermal dissipation around the FETs - as I am relying on the PCBs as the heat-sinks. 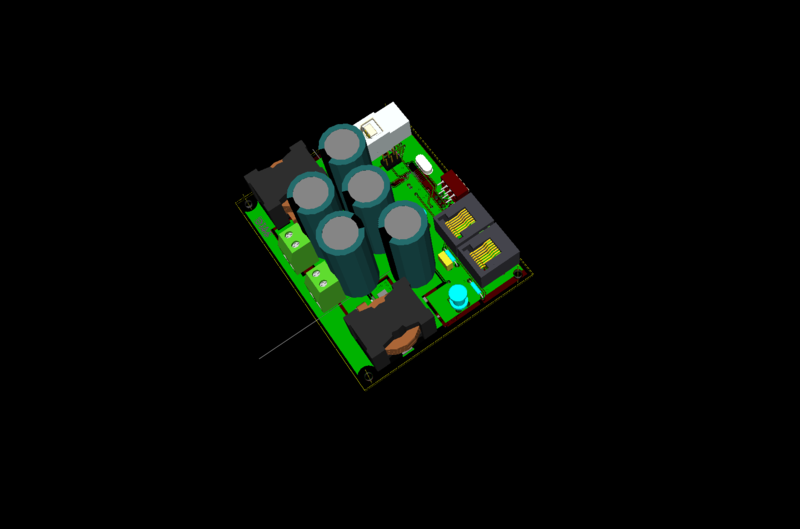 Look for a physical interference between the caps and the large solar and battery connectors - the 3D rendering shows an overlap, but the connector 3D modes are mocked up and may not be accurate. And I want to put some time into the xxM1 uCs and Arduino IDE - there are a few postings out there about using the uC with the Arduino IDE, want to make sure it will actually work before getting much further along. There is a lot going on family wise these days, the above may take me a bit of time to complete. My intention is once I complete some of the tasks above to order a set of 3x OSH-PARK PCBs and a set of components to build one up. If someone is interested in building up one of the other PCBs, drop me a line. At that time will also post up the CAD files to the links above. I figure once things are proven a bit, will revise the PCB and get a set of them made - perhaps look into have some of the SMT parts machine assembled. Might also revise the FETs to the 'better', but harder to hand assemble, QPFP packages.